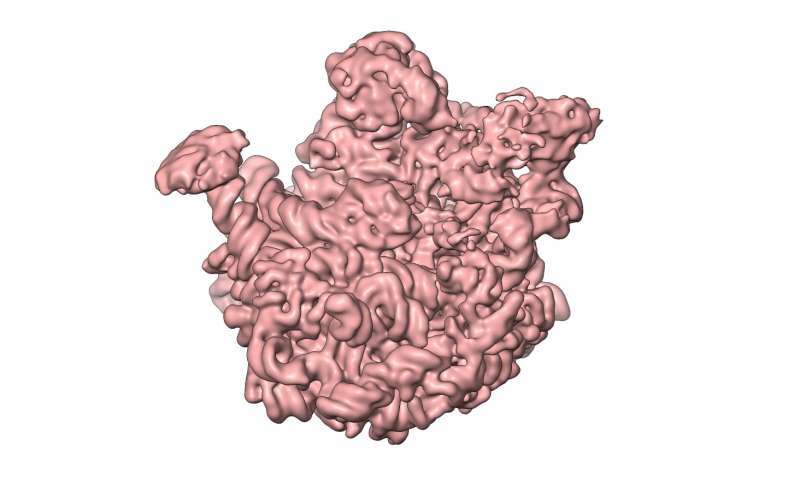 Berlin-based researchers have produced snapshots of cellular ribosomes. Their findings could set us on the path towards a new class of antibiotics. The study—a basic science study conducted by researchers from Charité - Universitätsmedizin Berlin and the Max Planck Institute for Molecular Genetics—has been published in Molecular Cell. Ribosomes are the "protein factories" of the cell, and are composed of two units: a larger 50S subunit, and a smaller 30S subunit. The 50S subunit in turn comprises 33 proteins and two ribonucleic acid molecules. The aim of the study was to obtain detailed information about the way in which these molecules form 50S subunits in bacteria. In a process known as 'in vitro reconstitution', the individual components were first purified and then mixed together in the laboratory. The researchers then observed how the 50S subunit assembled from this mixture. Using 3-D cryo-electron microscopy, they were able to produce high-resolution snapshots of individual stages of the 50S subunit's assembly and maturation. This allowed them to identify the individual steps involved in its development on a molecular level. Explaining the significance of this study, Dr. Rainer Nikolay, of Charité's Institute of Medical Physics and Biophysics, says, "These results do not simply provide us with important insights into one of the essential processes taking part inside the cell. They also provide us with information on potential targets for new antibacterial drugs." These could potentially inhibit ribosome assembly, thereby paralyzing the bacterium's ability to synthesize proteins; these drugs could therefore be used to inhibit all bacterial growth. Dr. Nikolay plans to conduct additional research to test whether the process of 50S subunit assembly inside the living cell is the same as that observed outside the cell. He says, "Much of the information available in the literature suggests that 50S assembly in vivo follows a very similar course to that observed in vitro. To test this assumption, we are currently developing methods capable of analyzing the structure of 50S ribosomal subunit precursors, which we will obtain directly from cells."